When Lieutenant Thomas Talbot toured Upper Canada with the province's first Lieutenant-Governor, John Graves Simcoe, he was immediately smitten. 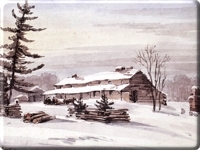 After he resigned from the army with the rank of Colonel in 1804, Talbot secured five thousand acres of land to establish a settlement at Port Talbot south of London on the Lake Erie shore. He had wanted to recruit Englishmen: "My advice," he wrote to a friend, "is that you should, as much as possible, avoid placing Highland Scotch settlers ... as of all descriptions they make the worst settlers on new roads - English are the best." But the Englishmen were unavailable, and Talbot liked other ethnicities even less than he did the Highlanders. 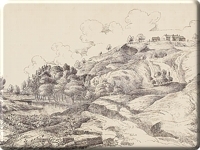 When the first Scottish settlers came between 1816 and 1818, Talbot clustered them together in Aldborough and Dunwich townships. 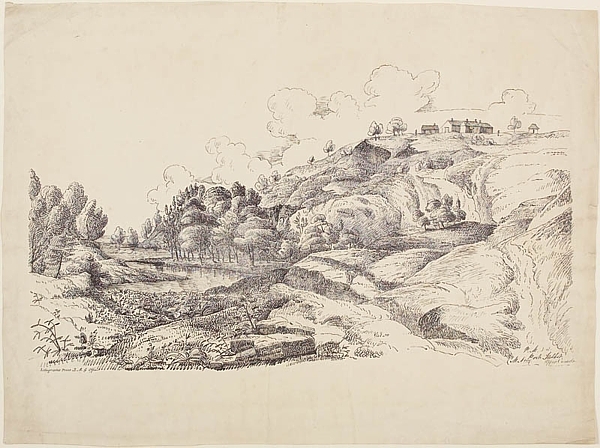 Some came directly from the Highlands, while others were trying their luck in Upper Canada after failing to establish themselves in New York State or in the Selkirk Settlement at Red River, Manitoba. The first three families to settle in Aldborough hailed from Caledonia, New York, and arrived in May 1816. 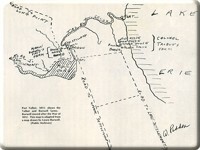 Archibald Gillies, Alexander Forbes, and Neil Haggard, all Highlanders, exuded considerable time and effort searching for the right farm lands before approaching Colonel Talbot with their requests. The men sheltered their families in log houses with bark roofs; pieces of clay filled the chinks and holes in the walls. With antiquated firearms and little by way of ammunition, these families hunted for wild turkeys by trapping them in pens using trails of grain as bait. Although they brought a few oxen and cattle with them, they were not successful in breeding their livestock, and few families had animals by the 1820s. Aldborough hadn't much wheat or corn either, so a small group of men would travel to Buffalo once or twice a year for the neighbourhood's supply of flour and other necessities. The settlers relied on the open fireplace to light their homes, and in the autumn they made ample supplies of candles to get them through the dark winter. 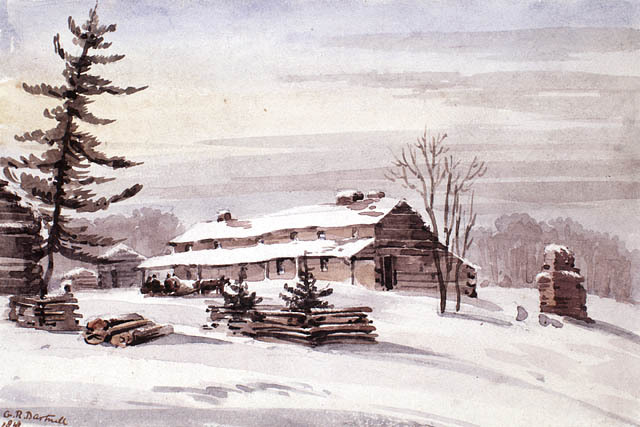 "Old Homestead in the Talbot Tract"
During those long winter evenings, two or three families would gather in a neighbour's house to socialize. Surrounded by the warmth of the fire, they "would recount incidents of their earlier days in the heathery hills of 'auld Scotia'." 1 Pious Presbyterians, these families often debated religion with zeal and enthusiasm. Prior to 1820, the majority of Aldborough's settlers belonged to the Kirk of Scotland, the rest adherents of the Baptist faith. In those days, securing a minister for a Sunday service was quite difficult; the most dedicated worshippers walked as far as twenty miles to distant towns to listen to the preaching of the Gospel. It had taken many years for a store to finally open in Aldborough, and many more years passed before the residents got their own church. James McKinlay donated a plot of land in 1835 for the construction of western Ontario's first Presbyterian Church. Duncan McKillop and his wife left Scotland in 1816. After landing in Quebec, they made their way to Port Talbot, where three neighbouring families from their home in Argyllshire had settled. 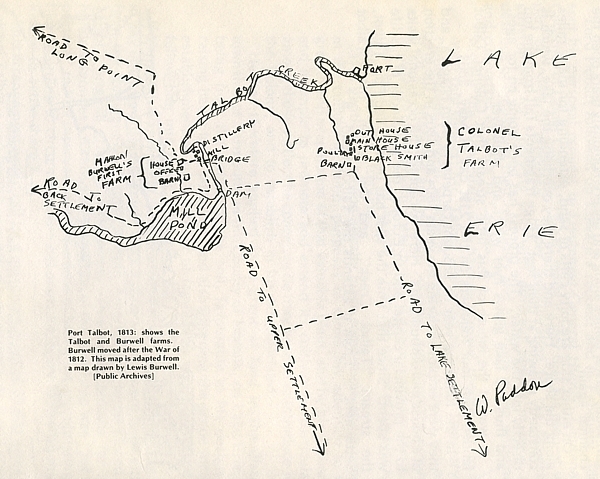 The McKillops, like the McNabbs, McKellars, and McDougalls, had been farmers and fishers, and they settled on Lot 17. However, with only one cow to support his family, Duncan had to take work as a hired hand in the winter. His wife also found a job that paid one dollar per week. At the end of the winter, the couple had managed to save enough money to purchase a second cow. The next season, their fifty-acre lot yielded enough corn, potatoes, and oats to sustain them, but several harvests passed before they got a good supply of wheat. The early settlement suffered poor harvests and deadly diseases in its early years. The Scots who came to Aldborough had, for the most part, brought little more than blankets, clothing, and some utensils with them, and lived in poor conditions for many years. Unable to sell anything but their labour, these pioneers nevertheless succeeded because they kept their spirits high and looked after one another. The Scots had few equals when it came to communal cooperation. Colonel Talbot's country was named Elgin in honour of James Bruce, 8th Earl of Elgin and 12th Earl of Kincardine, Governor-General of Canada 1846-1854. While the English guided the community's larger political life, and named its townships after places in their home country, the Scotch lent tiny neighbourhoods names such as Iona, Wallacetown, Port Bruce, Glencoe, etc. When railroads arrived in the 1870s, linking Elgin County with Buffalo and Detroit, villages and trading centres flourished around the train stations. By the latter decades of the nineteenth century, the countryside had taken much of its present-day shape. Galbraith writes about a community with a concentration of Scotch names rivaled nowhere but the Western Isles. In 1837, the wife of a provincial judge was visiting Port Talbot and remarked on the inhabitants of the Scotch community: Mrs. Jameson was struck by "'Their clannish attachments and their thrifty, dirty habits - and also their pride and honesty.' They had not changed appreciably by my time," Galbraith chuckles. 3 Despite their durable aromas and penchants for whisky, the hardworking men and women of The Scotch worked closely with each other to select their leaders, nurture their community, and win the graces of God.